Peterborough Panthers are anxiously awaiting medical bulletins on two riders who crashed last night (May 18). Panthers duo Bradley Wilson-Dean and Kenneth Hansen were involved in spills while riding for other clubs. Wilson-Dean suffered a suspected broken bone in his hand when taking a first-heat tumble during Swindon’s SGB Premiership home defeat at the hands of King’s Lynn. The New Zealand champion completed the remainder meeting in discomfort and is now set to go to hospital this morning (May 19). Meanwhile Hansen withdrew from a Swedish second division fixture after a crash in his opening ride. He was taken to hospital with rib damage and a fracture to his breastbone after the smash while riding for Vargarna at Vastervik. 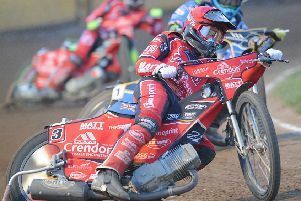 But Hansen is due to fly into the UK this morning and Panthers bosses are optimistic he will be fit enough to face bottom side Berwick at the East of England Arena tonight (Friday, 7.30pm). Wilson-Dean was already due to miss the clash against the Bandits due to an SGB Premiership fixture clash. Panthers ride at Berwick tomorrow (May 20) before travelling to Newcastle on Sunday (May 21), both in league matches.